We are a global network of volunteers trained and ready to collaborate online in the immediate aftermath of a natural disaster. We exist to effectively assist crisis affected communities through co-operation with local and international responders. 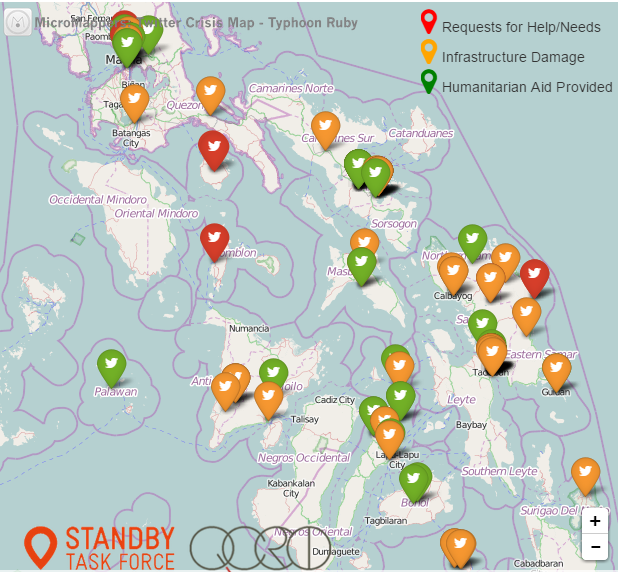 We aim to increase the ability and skills of SBTF volunteers through a continuous dialogue and coordination with other tech and crisis mapping volunteer efforts. This will enable SBTF to provide a sustainable and predictable service to first responders. Some members of the SBTF are professionals working in the fields of ICT and humanitarian response; many others come from diverse backgrounds and have been trained by the SBTF in the necessary skills to contribute. The SBTF is a volunteer organization; it is a platform, a shared space for those who have skills to offer (or are willing to learn skills) to assist crisis affected communities through the use of technology.